Fifteen year old Gavin has been different all his life, although he isnâ€™t really sure why. His parents donâ€™t understand him, his school has now suspended him and friends appear to be a distant rumour. As he has grown older, his imaginary friend, the mysterious Miss Grey, seems to be making the transition from imagination to reality. Or was she always real? All Gavin knows is that when his estranged aunt Gwen invites him to visit her in Cornwall he jumps at the chance to get away from his parents and life in London. After a semi-traumatic train journey, Gavin arrives in Cornwall but aunt Gwen is not there to meet him at the station. He makes his way to her home and a note scribbled in Gwenâ€™s writing sends him on a voyage of discovery in her footsteps. He soon meets the strange inhabitants of the village and discovers that his gift may not bring good and the truth may not be what he wants to hear.Â There are voices, visions and fear, dark terrors and things that belong in nightmares. In 1537, the greatest magus of them all, Johann Faust, seeks immortality and sets out with his travelling cloak, staff and a priceless peasantâ€™s ring in which he has bound all the magic in the world. But the magus falls in love and makes a bargain. The ring is lost and magic is taken from the world, trapped under water and air for centuries waiting to be released. Now, magic is coming back to the world and Gavin finds himself at the heart of it. Advent is an intelligent blend of reality and legend. 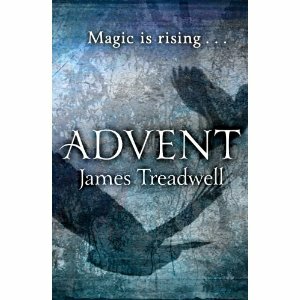 Amongst the coming-of-age story of Gavinâ€™s adventure, Treadwell incorporates a fresh re-telling of the Faust and Arthurian legends. It seems unlikely that a book that combines Faust, Helen of Troy, a mermaid, a witch, a warlock, the prophetess Cassandra, an ancient magic, a peasantâ€™s ring and a young boy will ever provide a coherent narrative, but somehow Advent manages it. The ending provides just enough of a conclusion for the reader to feel that the story is resolved yet at the same time opens the possibilities of a whole new set of adventures from the threads left behind. When I began reading and met the host of characters â€“ an interesting blend of the young clashing with the ancient â€“ I did not expect such a dark and intriguing set of events and I now understand why the book will be pitched to both the adult and young adult markets. It is a mature telling of an intricately woven and highly involved story and has a lot to recommend. This is the kind of book that will reveal more each time it is re-read and I wouldnâ€™t be surprised if the series becomes a staple.